This is a very delicious healthy casserole! 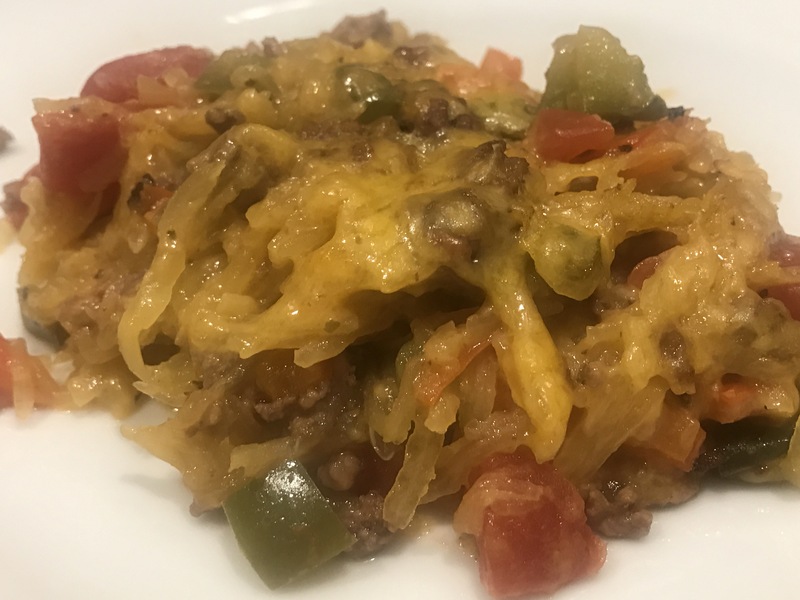 The spaghetti squash is the star in this recipe. Place squash on a baking dish with the cut half side up. Bake for 40 minutes. Remove from heat and let it cool. When cool, shred the pulp with a fork. In a skillet on medium-high heat, brown ground beef until evenly browned. Add diced peppers and minced garlic. Cook until vegetables are tender. Add in shredded spaghetti squash and drained diced tomatoes. Cook until heated through. Add in 2 cups of shredded cheddar cheese and make sure it’s melted before you remove it from the heat. Grease a 13″ x 9″ glass baking dish. Pour contents in this dish. Bake for 25 minutes. Then take it out. Add 1/4 cup shredded cheddar cheese, bake again for 5 minutes or until the cheese is melted.